2nd Monday at 8 P.M.
Thursday 14th November is diabetes awareness day. Diabetes is one of the fastest growing diseases in the world today and affects people of all races, income levels and ages even children. It is estimated that 629 million people will be diagnosed with diabetes by the year 2045. Diabetes is one of the five Global Causes that Lions the world over support. Helen’s quote “Alone we can do so little. Together we can do so much”. This is so true and also very fitting to all our efforts with SleepOut this month. So many people both within our Lions group and within the community have used their talents, individual personalities and passions to achieve so much for the project. It is amazing what a team of people can achieve. Overnight on Saturday 6th October, was very cold and damp and also the night that people spent sleeping 'under the stars' to raise much needed funding for the Wellingborough Homeless Forum Winter Nightshelter. The success of the event, which raised over £5,000.00, was due to a number of groups all working together to make a difference. Each participant received a warm woolly hat, much appreciated on a chilly night under the stars. These were knitted by WIK Knit & Natter Group, St Barnabas Church congregation, as well as friends and family of Lions. Hot drinks were supplied throughout the night and breakfast served in the morning by the Lions. President Lion Amanda, presented each participant with a certificate of achievement, thanking them for their contribution to such a good cause. The Mayor of Wellingborough, Councillor Malcolm Ward, visited the event, giving encouragement to those taking part and to also judge the 'most creative dwelling competition'. Huge thanks to St. Barnabas Church for so generously allowing the church hall and garden to be used for the event. Could this be an annual event for Wellingborough Lions and the community of Wellingborough? Watch this space! 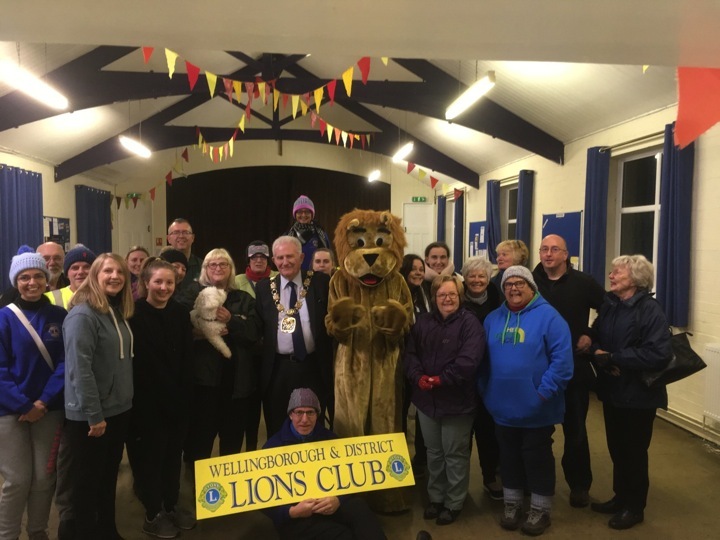 Participants of the Wellingborough & District Lions Club SleepOut 2018 Event with special guest, The Mayor of Wellingborough, Councillor Malcolm Ward. 206 countries around the world have a Lions Club. You don't have to be a member of the Church to be a Lions Club Member. The Motto of Lions Club International is "We Serve". The Lions Club for the Young is called Leos. Lions was founded in 1917, last year was the Centennial Year. Wellingborough & District Lions Club was chartered on 23rd October 1973 and is 45 years old. 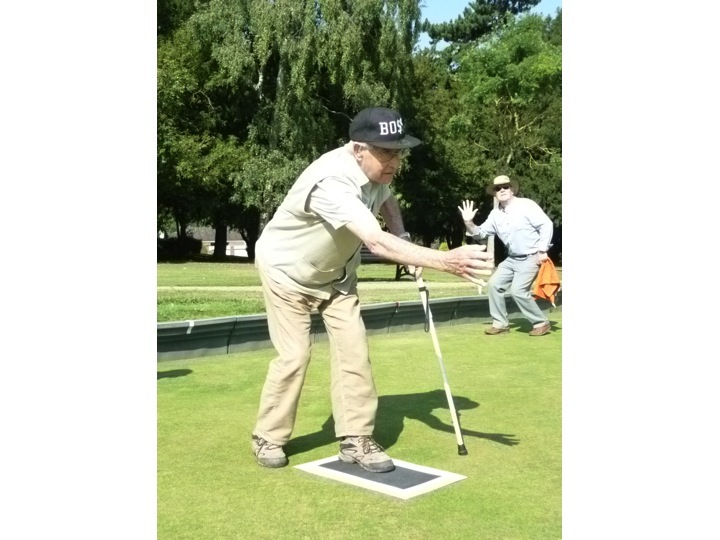 Wellingborough & District Lions Club holds its annual partially sighted bowls event in September. Lions members act as guides and human markers to enable the partially sighted to bowl more easily. Tea, cake and a good old natter always follow the game. Here is Lion Paul acting as a marker for the players. One of the Lions themes is Kindness Matters. Taken from Aesop’s Fables The Lion and the Mouse… “No act of kindness, no matter how small is ever wasted”. Be kind, always. I came across a quote by Ronald Reagan the other day that I thought I would share with you as an apt thought for the month at the start of this Lions year…. ‘We can’t help everyone, but everyone can help someone’. take a pause to think….. What can I do to help? Wellingborough Lions celebrated the President's Handover 2018 by spending a Saturday afternoon drinking Pimms and eating a delicious afternoon tea. The day was blessed by the sunshine and the company of friends. 2017 was a fantastic year. Lion Roger did us proud. He can have a well deserved rest now! Wellingborough & District once again assisted at this year's sport's day for children with special needs. Its a fantastic day, giving the youngsters a chance to have a go at sporting activities like javelin, curling, long jump, mini hurdles, skittles and pull bag. The teams are awarded with trophies and medals to congratulate them on their achievemnts. Together the Lions do amazing things. There's a Lions Club not far from you that is doing amazing work within their community. If you would like to get involved, check out Facebook. Clubs in Wellingborough and nearby are: Wellingborough & District, Kettering, Rushden and Northampton Lions. You too could become a Lion. 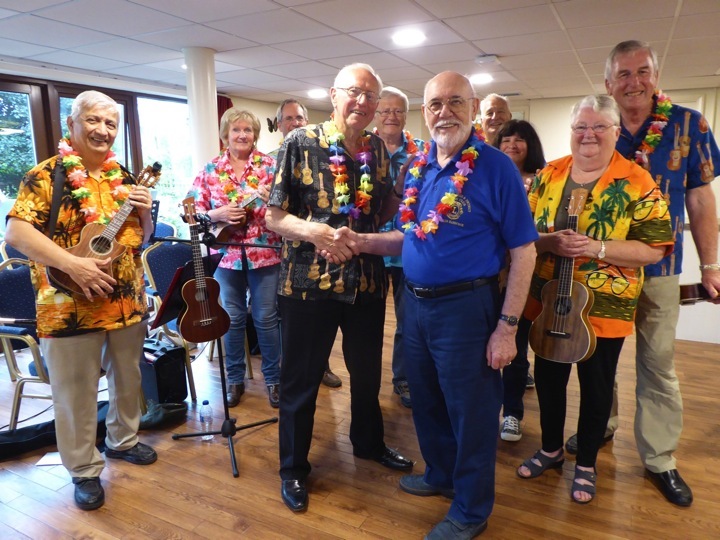 President Lion Roger presenting a cheque for £100 to give to the U3A Ukulele Bands chosen charity - Alzeimer's Society. Wellingborough & District Lions Club arranged an afternoon of musical entertainment for the elderly resident's of Rosewood Court, a retirement village in Wellingborough. The lively music was played by Wellingboroughs U3A Ukulele Band and featured songs that many of the audience remembered from their teenage years. Songsheets were provided and their were smiles and toe tapping all round. During the break, everyone enjoyed tea, cake and friendly banter. Wellingborough Lions is aiming to provide entertainment for the elderly around Wellingborough every quarter. On Saturday 28th April, Wellingborough & District Lions were out serving the community in Wollaston. Wellingborough Lions and Wollaston is Kind (WIK) came together to build a raised bed and prepare the allotment for the year ahead. The project was funded by Wellingborough Lions and will enable the less abled members of the community to get involved in gardening and the allotment life. 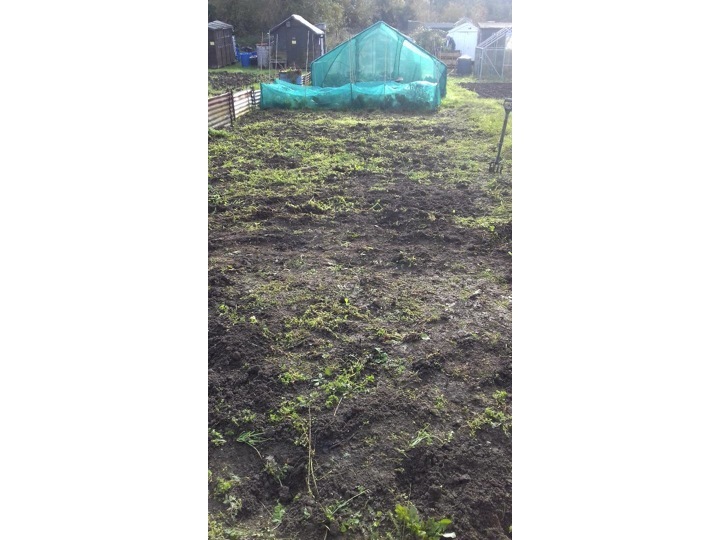 Volunteers also built a poly tunnel, dug, weeded, planted and generally cleared everything ready for the summer. WIK provided a delicious BBQ. All the food grown on the allotment is used to assist families that may need a little support. 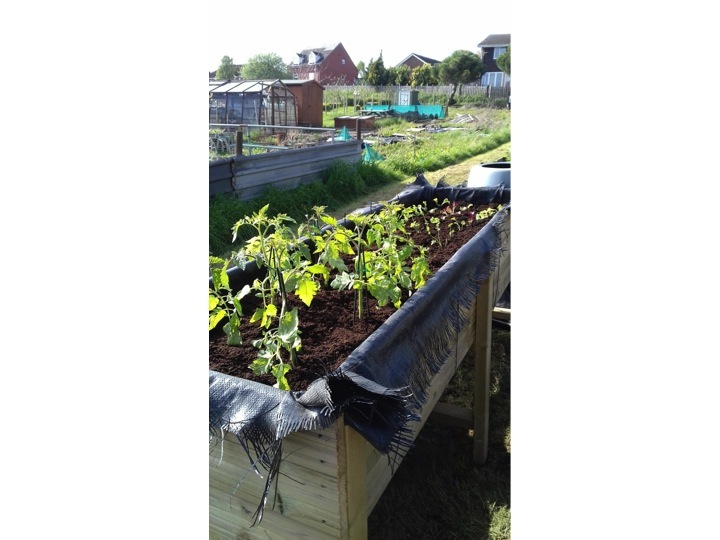 Raised bed built for WIK "We Serve Whatever The Weather"
Congratulations Mr Lee Garratt from Wellingborough, you win £20! A BIG thank you to all those that took part, we hope you enjoyed the challenge. Here are the answers. 71 quiz sheets were returned and only 7 got 100% correct! The Lions Clubs of the British Isles are currently celebrating the 100th anniversary of Lions Clubs International - 100 years of proud service to our communities. Patron, HRH, The Countess of Wessex GCVO, hosted a Reception at Buckingham Palace on Wednesday 28 February to help Lions Clubs mark this milestone. Amanda Coleshill, who represented Wellingborough Club, joined Lions from Kettering, Corby and Rushden, as well as members from across the British Isles, at the Centenary Reception, together with the organisation’s charity partners. Wellingborough & District Lions Club help their local community through fund-raising and support for Home Start, Wellingborough Food Bank, The Daylight Centre, Glamis Hall, a number of youth activities and projects to help the disabled and elderly. 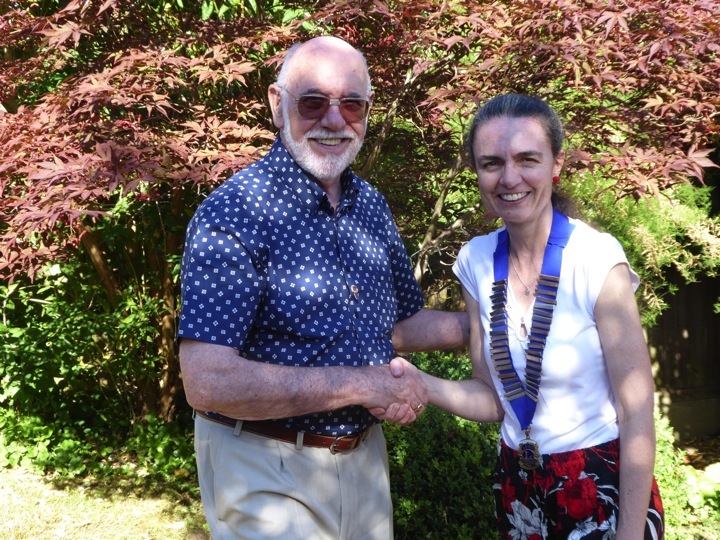 The club also supports major projects that address diabetes, the environment, water aid, hunger relief and sight issues affecting communities throughout the world. 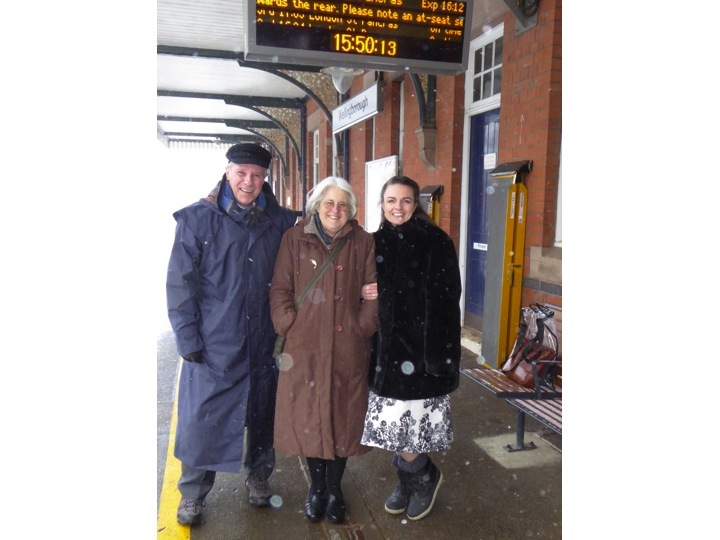 Despite the freezing weather conditions and cancelled trains, Lions Amanda Coleshill from Wellingborough (right), Marion Hollis from Rushden (centre), accompanied by District Governor Chris Burrows, remained cheerful as they waited patiently on the platform at Wellingborough Station for the next train to London. On a cold, wet Saturday morning, members of Wellingborough & District Lions Club went down to the allotment to do some weeding, pruning and maintenance. 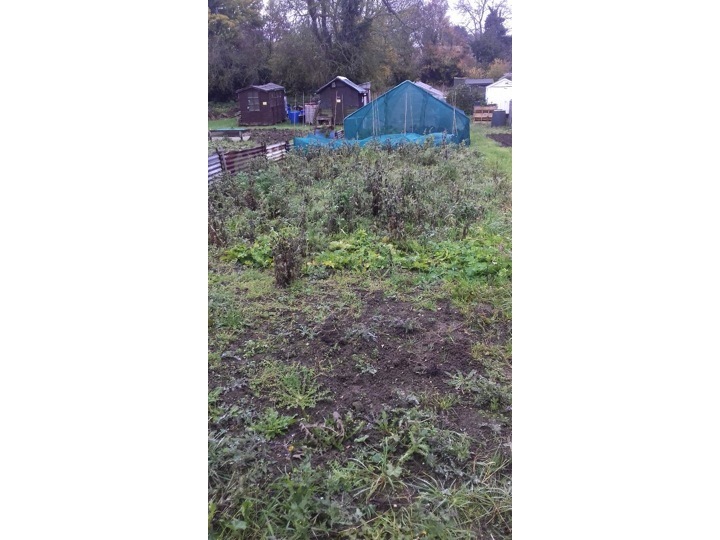 The allotment is part of the Wollaston Is Kind Community Project (WIK). WIK grow and harvest food and use it to feed those in need in the local community as well as make chutneys and jams to sell. The Lions will be helping out at the allotment on a regular basis once the Spring comes. The next part of the project is to make some raised beds to enable disabled people to plant and harvest food. 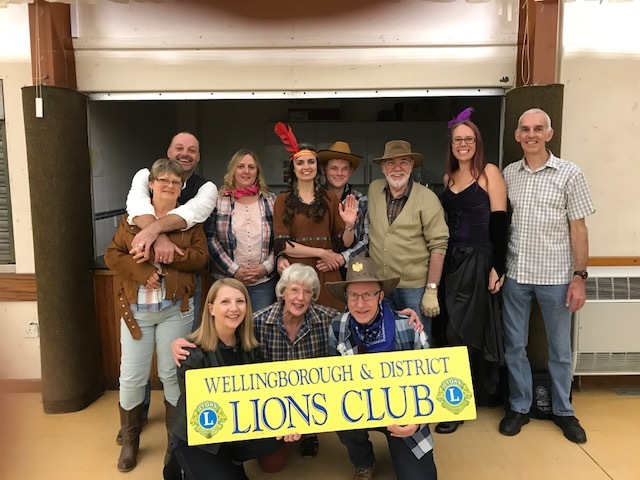 Members of Wellingborough & District Lions Club fulfilled their promise to help raise funds for the upkeep of Glamis Hall, a popular community centre in Wellingborough. 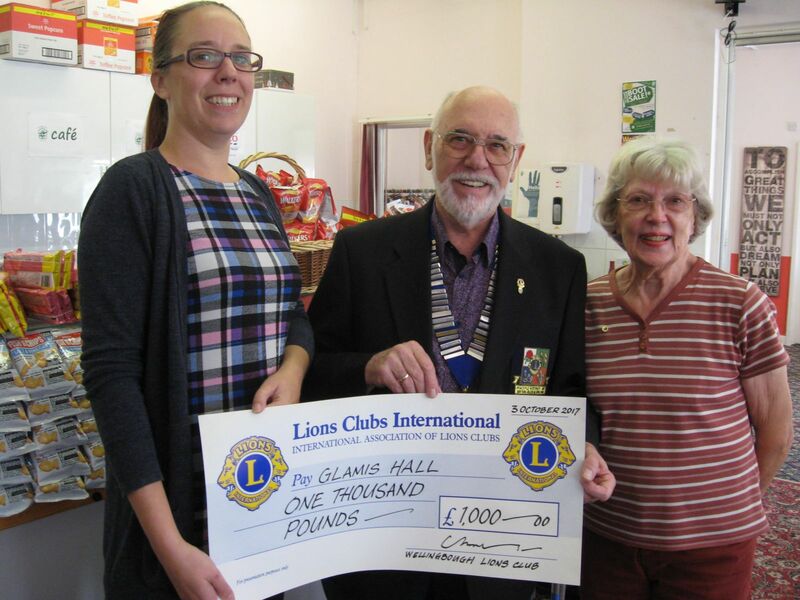 The proceeds from a successful Barn Dance organised by the Lions at Glamis Hall in September, was boosted by a donation from the club’s charitable fund to make a total of £1,000, which was presented to Glamis Hall’s manager, Jo Peploe, by Lions Club President Roger Handcock. Lions Members and Jo from Glamis Hall in their Western glad rags! 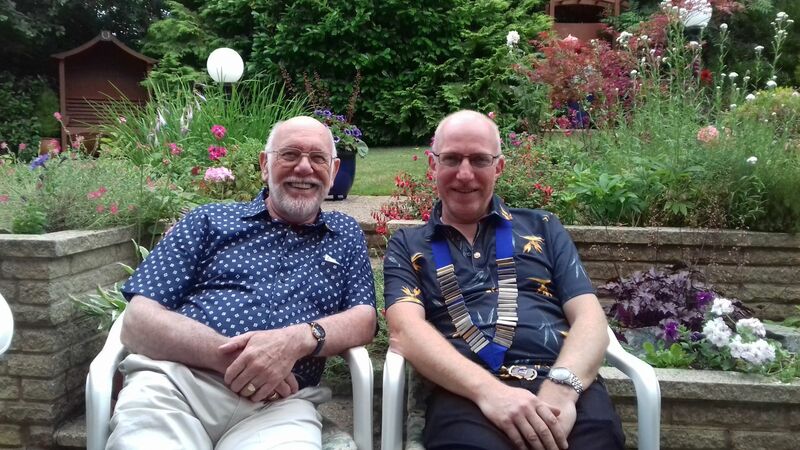 During the summer months Wellingborough Lions have been busy in the garden. Not just any garden but the garden of Rosewood Court, retirement village. 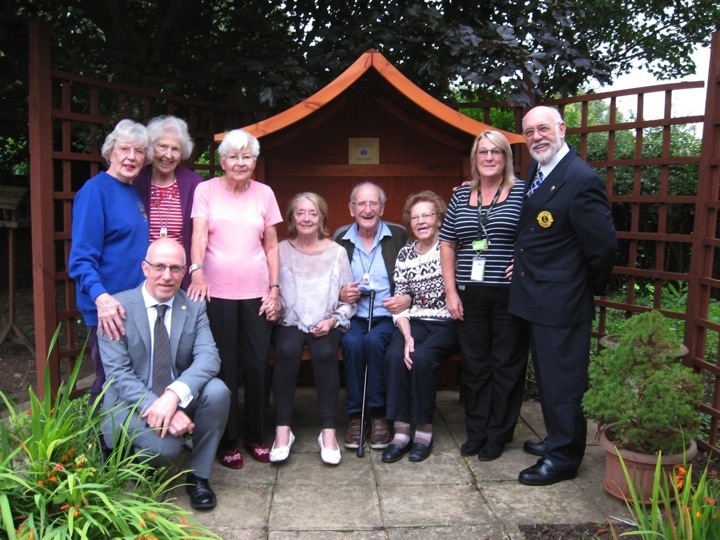 To celebrate the Lions Centenary, Wellingborough Lions bought and built an arbour for the residents and added a commemorative plaque to finish it off nicely. Lion Roger has also been busy painting the fences in the garden. 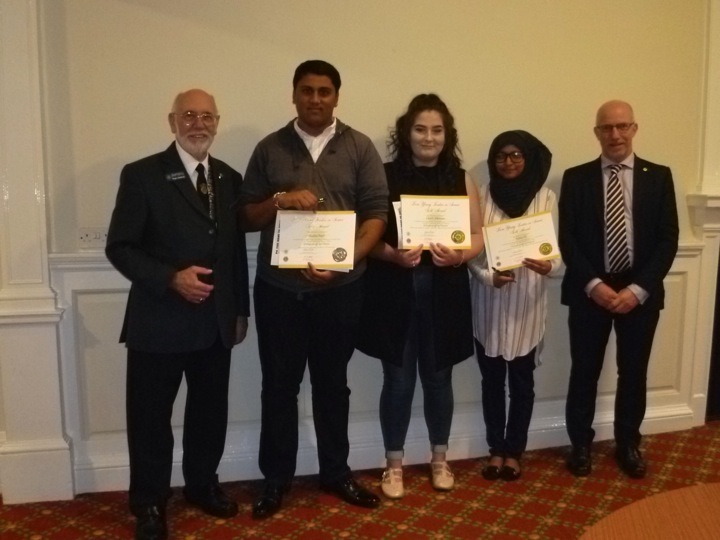 In August, members of Wellingborough & District Lions Club had the pleasure of presenting three Sir Christopher Hatton Academy students with their Lions Young Leaders in Service Awards. Pictured from left: Lion President Roger Handcock with students Shailen Patel, Charli Atkinson and Salma Ali, together with Past President Adrian Jeffs. These awards recognise young people who provide significant levels of service to their communities. There are two award levels: the Silver Award for young people who provide at least 50 hours of service to their community during a twelve month period; and the Gold Award for those who provide at least 100 hours of service during a twelve month period. Young people between the ages of 11 and 18 (school years 7 to 13) are eligible to participate in the Young Leaders in Service awards. Activities are in a range of categories such as: Service to the elderly; Service to children; Service to parents or family; Safety training; Education; Environment; Services for the homeless; Public health; or helping the Lions with their activities. All the hours can be from the same activity or from a variety of services. If you are a school or youth organisation and would like to get take part in the awards, please contact us. Congratulations to everyone that took part this year! 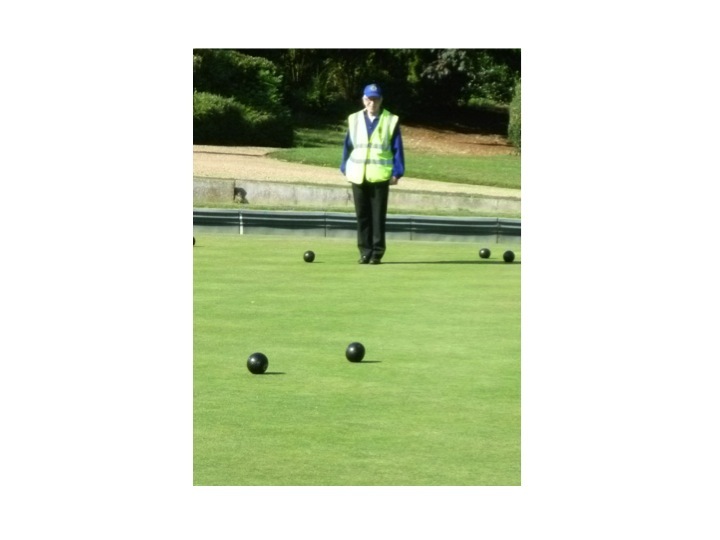 On the first Saturday in September, Wellingborough & District Lions organised a couple of games of bowls at the Swanspool Pavillion for the partially sighted. We were blessed with a lovely sunny morning and everyone was in fine form. This is becoming an annual event and is great fun for everyone. We finished the morning off with a lovely cuppa and a piece of cake. We hope to put on another event next year. Wow! What a great Lions year its been. Wellingborough & District Lions have achieved so much. The pride of Lions have served the community helping all age groups. Raising funds to purchase a garden seat for Rosewood Court Retirement Village, supporting the young achieve their Young Leaders in Service Awards, feeding the homeless by donating food and winter clothing to the Daylight Centre as well as cooking Christmas dinner for the homeless and needy in the Rushden and Wellingborough area. A pledge has also been made to St. Johns Ambulance to assist the purchase of a defibrilator for use in Wellingborough. Caring for the environment has also been important. We had a successful day cutting the reedbeds at Stanwick Lakes Country Park to enable the birds to fly into the lakes. Other important projects consist of recycling spectacles and hearing aids, distributing message in a bottle and donating to important projects worldwide. Well done to Lion Adrian Jeffs for being a fantastic President and keeping us all motivated in good humour this year. HAPPY BIRTHDAY LIONS, 100 TODAY! On June 7th 1917 Lions Club International was founded by Melvin Jones. Since then Lions all over the world have truly lived up to their motto "We Serve" by helping people in over 200 countries around the world. To mark the occasion, Lion Amanda has challenged herself to write a post a day for 100 days on Facebook. This is to get the word out there about Lions and what we do - although Lions serve in over 200 countries and have approximately 1.4 million members, it is one of the world's best kept secrets. Lion Amanda is hoping to get 100 followers within the year of the Lions birthday. The Wellingborough and Lions page has reached 74 to date! Copy and paste the link below into your web browser to see what we have been up to and to find out more about the world of Lions. Wellingborough & District Lions Club meet every month. The second Monday of the month is our business meeting where members discuss future events and plan fund raising activities. May 22nd 2017 - Meal at Voujon Indian Restaurant in Wellingborough. Potential new Lions social event. All welcome! July 1st 2017 - President's handover BBQ - summer social. August 20th 2017 - Party in the Park - Abington, Northampton. September 2017 - TBC - Maybe Tenpin Bowling. November 5th 2017 - Charter Anniversary Lunch, La Rocca. December 2017 - Christmas Meal at Pizza Venezia in Rushden. January 2018 - No social. February 15th 2018 - Fifth Annual Zone Quiz Night at Great Doddington Memorial Hall. March 19th 2018 - Tenpin Bowling. If you would like further information on any Lion activities please click on the "Contact Us" at the left hand side of the page.